This is just for anyone who doesn't think that adding case fans makes that much of a difference. I recently had a case fan go south on me. It started rattling and vibrating. May have knocked it around a few too many times. Well, I have an Antec KS-188 that I leave the case walls and front bezel off for now, with two 80mm fans on the bottom front for intake, and two 80mm fans for exhaust on the top back. Well, I was planning on replacing both front fans with two Delta screamers, so I can filter them, and still have plenty of airflow. I have a 1.4 T-bird running 1549 at full voltage on an 8KHA+ with a Swiftech MCX462. It used to run about 38*C idle, and 42*C full load. I test the temps with digital doc 5. So I let it sit with just those two case fans in the back exhausting, and none in the front. It sat like that a few days. I noticed it was warm while plugging in my USB headers (that's another thread), but didn't worry about it. After all, I've got my CPU, northbridge, and GPU all in the same place. It's bound to get warm. Well, last night I was surfing the web, and glanced down at my digital doc. My CPU was at about 47*C just surfing the web!!! I let it sit for a bit, and it only went down to 45*C idle. I'm going to go get the Deltas tonight, and I'll tell you how low my temps get after I put them back in. But if you've ever wondered if case fans really made that much difference, here's your answer. They make a load of difference. multiple delta screamers? you got guts m8! Case fans make a huge diference to my system. I have an 80mm at the front blowing in..and another 80mm at the back level with the CPU blowing in. Then two 120mm's at the top blowing out. With the 120's I have a "boost" button on the front of my case to short the rheostat to get them to spin up. once there turning yu can run them slower but they cant get going on there own. Those big 120's make a big diference. Heres a pic of them and the red button. Already got one on my MCX462. It's not that bad. I'm going to filter them, and hope that kills some sound. I don't even run my machine in a case . . . Which is why my intakes are going to be faster than my exhaust. To make up for the filters on them. The exhausts are only about 15CFM, I think. I'm not 100% sure, but they are wussy. I also replaced the fans on my PSU with two of the same type, both exhausting (one exhausting from my case to my PSU, and the other exhausting from my PSU to the outside air). Then I plan on adding a fan to the top as a blowhole (probably a low speed 120mm) since I also want to add two filtered fans on the case side wall, one above my CPU, and another above my video card. Hopefully, that will keep the airpressure close to nothing, or at least negative. Case cooling is somewhat of APITA. As many mid's come with mount points for 2 80mm's(one intake. One exhaust) adequate cooling throughput for an AMD box at stock isn't possible without cutting holes--even if you saw out the cutesy patterns of holes that impede the airflow of the two 80mm's--and use the 80cfm Delta's. IMHO, stock AMD boxes need 100cfm throughput. Everyone's "geography" inside cases is different. So no single placement of fans fits all. I'll be able to do a temperature comparison of two very similar mids with very similar throughput, yet different fan placement soon. Should be interesting. This is all very true, Cloasters. 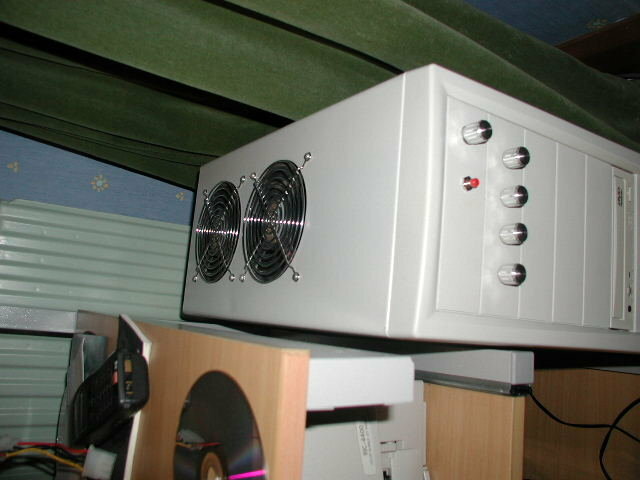 I run a full tower case in my main rig (the one in question) so airflow is really no problem. A few hours with a dremel and holesaw, and I've got tons of airflow. But my roommate has an old Dell case that's he's been upgrading slowly, and we spent some time with his case and the dremel and holesaw. Much harder to do with a mid-tower case. When I build systems for friends and family I just put a filtered 120mm 105CFM Panaflow fan(running it at 7V is more than sufficient) in the side panel so that it blows on the northern half of the motherboard, and I put one 80mm exhaust fan(Panaflow super quiet 23CFM work well) in the back(or up top) besides the one in the PSU. Last edited by dimmreaper; 20th February, 2002 at 02:08 AM.